Another changes has been made in Facebook. Now they add another features on their Groups Section which let the groups members to selling items from their profile. Today the social network released a press release. 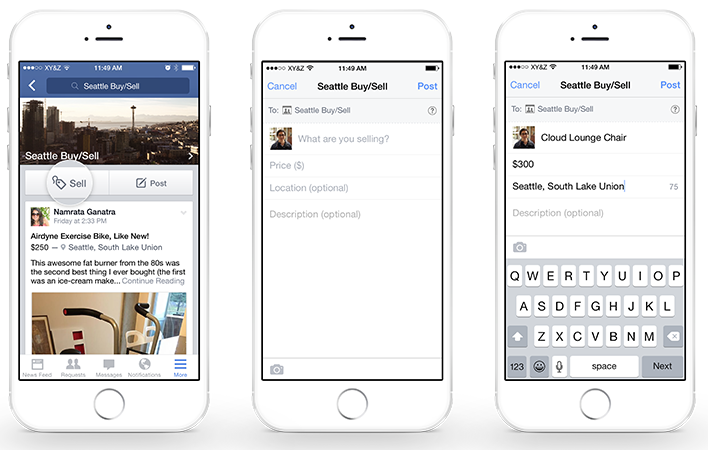 So now Facebook will take on the most popular classifies advertisements websites in US, Craigslist. Now, that’s the challenges ! What actually Facebook wants to do? They now introduce the ability to sell items and once the item is sold, it’ll be marked as sold. This will let them to capitalize their market through the social media. From Tuesday, the new feature already rolling on and user now capable to selling items through the groups where they are already joined. The newly feature will only shows in group and includes a method of cataloguing users’ items for sale and also let the users to mark an item as sold. The groups consist of facebook users who want to sell their items in a more intimate setting, whereas Craigslist or eBay is as public as it gets. Users offer items for sale by posting details+images about it on groups and as soon as a person comments of the item, they are connected offline with the item’s owner. The groups are similar to forums and are not formal; they often focus on particular neighborhoods, brands or items. For example, one such group owner says they prefer the new Facebook feature to Craigslist, because it offers people a sense of security, because individuals need to log on with their real Facebook accounts, their real names, which spells out that there are real people and not just usernames.